Members and supporters of United Food and Commercial Workers Local 789 celebrate their victory at the union hall in St. Paul, Minnesota, the evening after the vote. SOUTH ST. PAUL, MinnesotaWorkers from Dakota Premium Foods were greeted with cheers and clapping when they entered the United Food and Commercial Workers Local 789 hall January 25. The workers won an overwhelming victory in their fight to beat back a company-sponsored effort to decertify the union in the plant. The vote152 for the union and 82 againstwas an even greater margin of victory than the vote in 2000 that brought the union into the South St. Paul slaughterhouse. At that time workers responded to what they considered abusive conditions, especially the line speed, by organizing a sit- down strike in the lunchroom for more than seven hours. Coming out of that action, workers won union representation by United Food and Commercial Workers (UFCW) Local 789, and after an almost two-year fight, won their first contract. With the end of this contract in June 2007, a company-backed petition was circulated at the plant in an effort to decertify the union. Over the next six months union supporters responded. Pro-union workers, including a number who were involved in the earlier fight to win the local and contract, talked up the history of the struggle in the plant. Local 789 officials visited workers homes. Workers produced the Workers Voice newsletter to answer company lies. The newsletter also publicized the bosses attacks on workers and steps unionists were taking to stop unjust firings and other retaliatory discipline. At one point a delegation of workers went to management demanding that they stop denying union representatives entry into the plant. 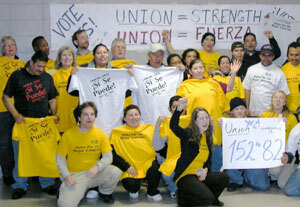 The day before the election 40 union supporters gathered outside the factory entrance at the end of the work shift. Some workers joined as they exited the plant. Chanting Sí, se puede (Yes we can) and Union, Union, they greeted workers in the freezing cold. Dozens held signs urging Vote Yes. Two large banners were held up, one saying Union = Strength in Spanish and English. The week before, thirty union supporters had demonstrated at the same gate. The decertification election was held January 25. After union supporters counting ballots ran out of the trailer where the voting took place, word of the victory spread rapidly. Dozens of workers went to the Local 789 hall. Each was welcomed with cheers, hugs, high-fives, and pats on the back. As news of the victory spread through the plant January 28, Sí, se puede echoed through locker rooms, hallways, and the lunchroom. Obdulia Flores, a kill floor worker with 11 years in the plant said that she thought that a number of workers who were against the union before are with us now. Others commented on how impressive the margin of victory was. Some said they thought the bosses expected an easy win against the union. In the months leading up to the election, the company held very few meetings with workers. One antiunion leaflet was passed out twice in the last two weeks. By contrast, the pro-union campaign included four issues of the Workers Voice in those two weeks, house visits, two demonstrations outside the plant, and ongoing one-on-one discussions among workers. In addition, pro-union workers got up to address their coworkers in the lunchroom in the days leading up to the vote. Carlos Samaniego is a member of UFCW Local 789 and works at Dakota Premium Foods. Rebecca Williamson, a trimmer at Dakota Premium and a member of Local 789, contributed to this article.